The Shepparton dialysis unit can accommodate seven patients per session during two sessions per day. This is a satellite unit of St Vincent’s Hospital Melbourne. The Dialysis Unit is located within the Graham Street campus of Goulburn Valley Health, Ground Floor, Building F.
Holiday dialysis enquiries can be made to the Nurse Unit Manager. Acceptance for holiday bookings is dependent upon availability, so please book as early as possible. Confirmation cannot be guaranteed until a week or two prior to the proposed dates. Referral for permanent dialysis at GV Health Dialysis unit should come via your existing dialysis unit/parent hospital. Holiday referrals may come from patients or dialysis unit staff. Ph: (03) 5832 2536 for bookings – GP referral is required for a specialist consultation. 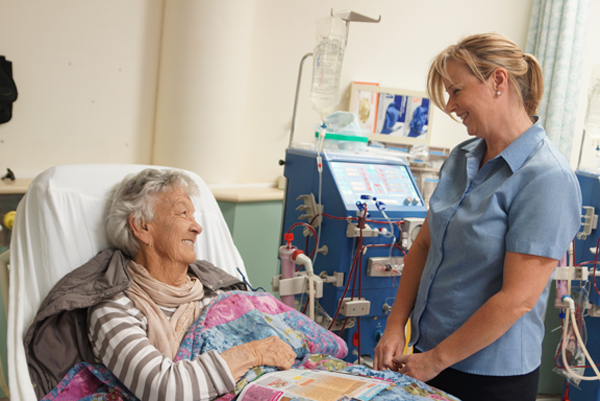 For information about dialysis and renal failure, GV Health recommends viewing the Kidney Health Australia website.